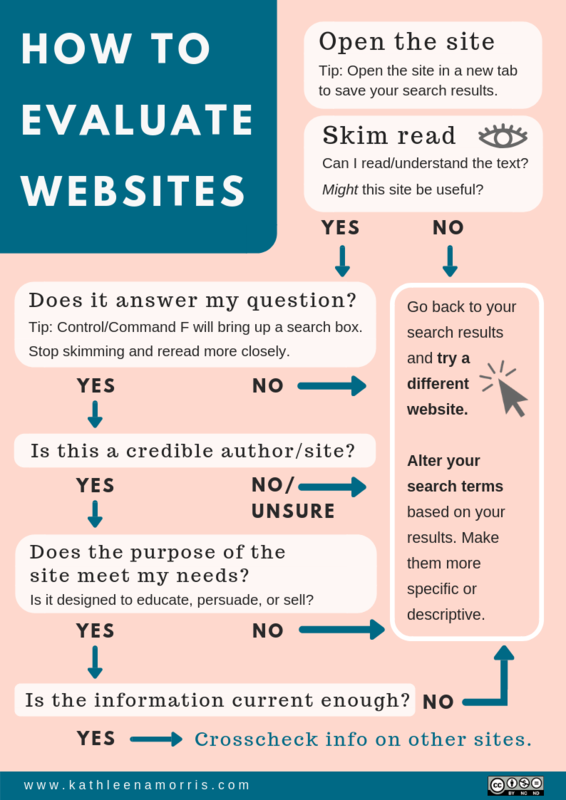 http://www.kathleenamorris.com/2018/11/20/evaluate-websites/ You will see that this is for high school students and their teachers. Read all the information and then look at this flowchart to understand clearly. Teachers want you to cite or write down the sources you have used. The punctuation and spacing you use needs to be what the Modern Library Association uses. The MLA format is an easy to use resource and it is made easiest by using a website like Citation Machine. NHS teachers approve of citation resources like Citation Machine and Easy Bib http://www.easybib.com/ . What is the best source of information on the Internet? Depending on what you need the information for depends on whether a site is a good one to use. Is it for a paper in your history class? Or is it for an essay to include with your application to college? Is it to settle an argument with a friend? Or do you want to find a recipe for spaghetti sauce? YOU will choose the Internet source based on what you will be looking for and for what it will be used. You can use Google to search for sites on your topic. You may type in "spaghetti sauce" and get too many choices. Slightly change the words in the find box "garlic spaghettie sauce". You will see the results will be slightly different, and may be just what you want.